31 A None No Power Seat 31 A is a Plus Smile Class Bulkhead seat which may have restricted legroom. Proximity to the lavatory and galley may be bothersome. There is no floor storage during takeoff and landing. The tray table is located in the armrest, making the armrest immovable and slightly reducing seat width. 31 C None No Power Seat 31 C is a Plus Smile Class Bulkhead seat which may have restricted legroom. Proximity to the lavatory and galley may be bothersome. There is no floor storage during takeoff and landing. The tray table is located in the armrest, making the armrest immovable and slightly reducing seat width. 31 H None No Power Seat 31 H is a Plus Smile Class Bulkhead seat which may have restricted legroom. Proximity to the lavatory and galley may be bothersome. There is no floor storage during takeoff and landing. The tray table is located in the armrest, making the armrest immovable and slightly reducing seat width. 31 K None No Power Seat 31 K is a Plus Smile Class Bulkhead seat which may have restricted legroom. Proximity to the lavatory and galley may be bothersome. There is no floor storage during takeoff and landing. The tray table is located in the armrest, making the armrest immovable and slightly reducing seat width. 32 A None No Power Seat 32 A is a standard Plus Smile Class seat. 32 C None No Power Seat 32 C is a standard Plus Smile Class seat. 32 H None No Power Seat 32 H is a standard Plus Smile Class seat. 32 K None No Power Seat 32 K is a standard Plus Smile Class seat. 33 A None No Power Seat 33 A is a standard Plus Smile Class seat. 33 C None No Power Seat 33 C is a standard Plus Smile Class seat. 33 H None No Power Seat 33 H is a standard Plus Smile Class seat. 33 K None No Power Seat 33 K is a standard Plus Smile Class seat. 34 A None No Power Seat 34 A is a standard Plus Smile Class seat. 34 C None No Power Seat 34 C is a standard Plus Smile Class seat. 34 H None No Power Seat 34 H is a standard Plus Smile Class seat. 34 K None No Power Seat 34 K is a standard Plus Smile Class seat. 35 A None No Power Seat 35 A is an Economy Smile Class seat located in the first row behind Plus Smile Class. There is a divider in front of this row which blocks views of the front of the plane. 35 B None No Power Seat 35 B is an Economy Smile Class seat located in the first row behind Plus Smile Class. There is a divider in front of this row which blocks views of the front of the plane. 35 C None No Power Seat 35 C is an Economy Smile Class seat located in the first row behind Plus Smile Class. There is a divider in front of this row which blocks views of the front of the plane. 35 H None No Power Seat 35 H is an Economy Smile Class seat located in the first row behind Plus Smile Class. There is a divider in front of this row which blocks views of the front of the plane. 35 J None No Power Seat 35 J is an Economy Smile Class seat located in the first row behind Plus Smile Class. There is a divider in front of this row which blocks views of the front of the plane. 35 K None No Power Seat 35 K is an Economy Smile Class seat located in the first row behind Plus Smile Class. There is a divider in front of this row which blocks views of the front of the plane. 36 A None No Power Seat 36 A is a standard Economy Smile Class seat. 36 B None No Power Seat 36 B is a standard Economy Smile Class seat. 36 C None No Power Seat 36 C is a standard Economy Smile Class seat. 36 H None No Power Seat 36 H is a standard Economy Smile Class seat. 36 J None No Power Seat 36 J is a standard Economy Smile Class seat. 36 K None No Power Seat 36 K is a standard Economy Smile Class seat. 37 A None No Power Seat 37 A is a standard Economy Smile Class seat. 37 B None No Power Seat 37 B is a standard Economy Smile Class seat. 37 C None No Power Seat 37 C is a standard Economy Smile Class seat. 37 H None No Power Seat 37 H is a standard Economy Smile Class seat. 37 J None No Power Seat 37 J is a standard Economy Smile Class seat. 37 K None No Power Seat 37 K is a standard Economy Smile Class seat. 38 A None No Power Seat 38 A is a standard Economy Smile Class seat. 38 B None No Power Seat 38 B is a standard Economy Smile Class seat. 38 C None No Power Seat 38 C is a standard Economy Smile Class seat. 38 H None No Power Seat 38 H is a standard Economy Smile Class seat. 38 J None No Power Seat 38 J is a standard Economy Smile Class seat. 38 K None No Power Seat 38 K is a standard Economy Smile Class seat. 39 A None No Power Seat 39 A is a standard Economy Smile Class seat. 39 B None No Power Seat 39 B is a standard Economy Smile Class seat. 39 C None No Power Seat 39 C is a standard Economy Smile Class seat. 39 H None No Power Seat 39 H is a standard Economy Smile Class seat. 39 J None No Power Seat 39 J is a standard Economy Smile Class seat. 39 K None No Power Seat 39 K is a standard Economy Smile Class seat. 40 A None No Power Seat 40 A is an Economy Smile Class seat. This seat may not recline due to the exit row behind. 40 B None No Power Seat 40 B is an Economy Smile Class seat. This seat may not recline due to the exit row behind. 40 C None No Power Seat 40 C is an Economy Smile Class seat. This seat may not recline due to the exit row behind. 40 H None No Power Seat 40 H is an Economy Smile Class seat. This seat may not recline due to the exit row behind. 40 J None No Power Seat 40 J is an Economy Smile Class seat. This seat may not recline due to the exit row behind. 40 K None No Power Seat 40 K is an Economy Smile Class seat. This seat may not recline due to the exit row behind. 41 A None No Power Seat 41 A is an Economy Smile Class Exit Row has extra legroom. This seat does not recline. There is no floor storage during takeoff and landing. 41 B None No Power Seat 41 B is an Economy Smile Class Exit Row has extra legroom. This seat does not recline. There is no floor storage during takeoff and landing. 41 C None No Power Seat 41 C is an Economy Smile Class Exit Row has extra legroom. This seat does not recline. There is no floor storage during takeoff and landing. 41 H None No Power Seat 41 H is an Economy Smile Class Exit Row has extra legroom. This seat does not recline. There is no floor storage during takeoff and landing. 41 J None No Power Seat 41 J is an Economy Smile Class Exit Row has extra legroom. This seat does not recline. There is no floor storage during takeoff and landing. 41 K None No Power Seat 41 K is an Economy Smile Class Exit Row has extra legroom. This seat does not recline. There is no floor storage during takeoff and landing. 42 A None No Power Seat 42 A is an Economy Smile Class Exit Row has extra legroom. There is no floor storage during takeoff and landing. 42 B None No Power Seat 42 B is an Economy Smile Class Exit Row has extra legroom. There is no floor storage during takeoff and landing. 42 C None No Power Seat 42 C is an Economy Smile Class Exit Row has extra legroom. There is no floor storage during takeoff and landing. 42 H None No Power Seat 42 H is an Economy Smile Class Exit Row has extra legroom. There is no floor storage during takeoff and landing. 42 J None No Power Seat 42 J is an Economy Smile Class Exit Row has extra legroom. There is no floor storage during takeoff and landing. 42 K None No Power Seat 42 K is an Economy Smile Class Exit Row has extra legroom. There is no floor storage during takeoff and landing. 43 A None No Power Seat 43 A is a standard Economy Smile Class seat. 43 B None No Power Seat 43 B is a standard Economy Smile Class seat. 43 C None No Power Seat 43 C is a standard Economy Smile Class seat. 43 H None No Power Seat 43 H is a standard Economy Smile Class seat. 43 J None No Power Seat 43 J is a standard Economy Smile Class seat. 43 K None No Power Seat 43 K is a standard Economy Smile Class seat. 44 A None No Power Seat 44 A is a standard Economy Smile Class seat. 44 B None No Power Seat 44 B is a standard Economy Smile Class seat. 44 C None No Power Seat 44 C is a standard Economy Smile Class seat. 44 H None No Power Seat 44 H is a standard Economy Smile Class seat. 44 J None No Power Seat 44 J is a standard Economy Smile Class seat. 44 K None No Power Seat 44 K is a standard Economy Smile Class seat. 45 A None No Power Seat 45 A is a standard Economy Smile Class seat. 45 B None No Power Seat 45 B is a standard Economy Smile Class seat. 45 C None No Power Seat 45 C is a standard Economy Smile Class seat. 45 H None No Power Seat 45 H is a standard Economy Smile Class seat. 45 J None No Power Seat 45 J is a standard Economy Smile Class seat. 45 K None No Power Seat 45 K is a standard Economy Smile Class seat. 46 A None No Power Seat 46 A is a standard Economy Smile Class seat. 46 B None No Power Seat 46 B is a standard Economy Smile Class seat. 46 C None No Power Seat 46 C is a standard Economy Smile Class seat. 46 H None No Power Seat 46 H is a standard Economy Smile Class seat. 46 J None No Power Seat 46 J is a standard Economy Smile Class seat. 46 K None No Power Seat 46 K is a standard Economy Smile Class seat. 47 A None No Power Seat 47 A is a standard Economy Smile Class seat. 47 B None No Power Seat 47 B is a standard Economy Smile Class seat. 47 C None No Power Seat 47 C is a standard Economy Smile Class seat. 47 H None No Power Seat 47 H is a standard Economy Smile Class seat. 47 J None No Power Seat 47 J is a standard Economy Smile Class seat. 47 K None No Power Seat 47 K is a standard Economy Smile Class seat. 48 A None No Power Seat 48 A is a standard Economy Smile Class seat. 48 B None No Power Seat 48 B is a standard Economy Smile Class seat. 48 C None No Power Seat 48 C is a standard Economy Smile Class seat. 48 H None No Power Seat 48 H is a standard Economy Smile Class seat. 48 J None No Power Seat 48 J is a standard Economy Smile Class seat. 48 K None No Power Seat 48 K is a standard Economy Smile Class seat. 49 A None No Power Seat 49 A is a standard Economy Smile Class seat. 49 B None No Power Seat 49 B is a standard Economy Smile Class seat. 49 C None No Power Seat 49 C is a standard Economy Smile Class seat. 49 H None No Power Seat 49 H is a standard Economy Smile Class seat. 49 J None No Power Seat 49 J is a standard Economy Smile Class seat. 49 K None No Power Seat 49 K is a standard Economy Smile Class seat. 50 A None No Power Seat 50 A is a standard Economy Smile Class seat. 50 B None No Power Seat 50 B is a standard Economy Smile Class seat. 50 C None No Power Seat 50 C is a standard Economy Smile Class seat. 50 H None No Power Seat 50 H is a standard Economy Smile Class seat. 50 J None No Power Seat 50 J is a standard Economy Smile Class seat. 50 K None No Power Seat 50 K is a standard Economy Smile Class seat. 51 A None No Power Seat 51 A is a standard Economy Smile Class seat. 51 B None No Power Seat 51 B is a standard Economy Smile Class seat. 51 C None No Power Seat 51 C is a standard Economy Smile Class seat. 51 H None No Power Seat 51 H is a standard Economy Smile Class seat. 51 J None No Power Seat 51 J is a standard Economy Smile Class seat. 51 K None No Power Seat 51 K is a standard Economy Smile Class seat. 52 A None No Power Seat 52 A is a standard Economy Smile Class seat. 52 B None No Power Seat 52 B is a standard Economy Smile Class seat. 52 C None No Power Seat 52 C is a standard Economy Smile Class seat. 52 H None No Power Seat 52 H is a standard Economy Smile Class seat. 52 J None No Power Seat 52 J is a standard Economy Smile Class seat. 52 K None No Power Seat 52 K is a standard Economy Smile Class seat. 53 A None No Power Seat 53 A is a standard Economy Smile Class seat. 53 B None No Power Seat 53 B is a standard Economy Smile Class seat. 53 C None No Power Seat 53 C is a standard Economy Smile Class seat. 53 H None No Power Seat 53 H is a standard Economy Smile Class seat. 53 J None No Power Seat 53 J is a standard Economy Smile Class seat. 53 K None No Power Seat 53 K is a standard Economy Smile Class seat. 54 A None No Power Seat 54 A is a standard Economy Smile Class seat. 54 B None No Power Seat 54 B is a standard Economy Smile Class seat. 54 C None No Power Seat 54 C is a standard Economy Smile Class seat. 54 H None No Power Seat 54 H is a standard Economy Smile Class seat. 54 J None No Power Seat 54 J is a standard Economy Smile Class seat. 54 K None No Power Seat 54 K is a standard Economy Smile Class seat. 55 A None No Power Seat 55 A is a standard Economy Smile Class seat. 55 B None No Power Seat 55 B is a standard Economy Smile Class seat. 55 C None No Power Seat 55 C is a standard Economy Smile Class seat. 55 H None No Power Seat 55 H is a standard Economy Smile Class seat. 55 J None No Power Seat 55 J is a standard Economy Smile Class seat. 55 K None No Power Seat 55 K is a standard Economy Smile Class seat. 56 A None No Power Seat 56 A is a standard Economy Smile Class seat. 56 B None No Power Seat 56 B is a standard Economy Smile Class seat. 56 C None No Power Seat 56 C is a standard Economy Smile Class seat. 56 H None No Power Seat 56 H is a standard Economy Smile Class seat. 56 J None No Power Seat 56 J is a standard Economy Smile Class seat. 56 K None No Power Seat 56 K is a standard Economy Smile Class seat. 57 A None No Power Seat 57 A is a standard Economy Smile Class seat. 57 B None No Power Seat 57 B is a standard Economy Smile Class seat. 57 C None No Power Seat 57 C is a standard Economy Smile Class seat. 57 H None No Power Seat 57 H is a standard Economy Smile Class seat. 57 J None No Power Seat 57 J is a standard Economy Smile Class seat. 57 K None No Power Seat 57 K is a standard Economy Smile Class seat. 58 A None No Power Seat 58 A is a standard Economy Smile Class seat. 58 B None No Power Seat 58 B is a standard Economy Smile Class seat. 58 C None No Power Seat 58 C is a standard Economy Smile Class seat. 58 H None No Power Seat 58 H is a standard Economy Smile Class seat. 58 J None No Power Seat 58 J is a standard Economy Smile Class seat. 58 K None No Power Seat 58 K is a standard Economy Smile Class seat. 59 A None No Power Seat 59 A is an Economy Smile Class seat. This seat may not recline. Proximity to the lavatories and galley may be bothersome. 59 B None No Power Seat 59 B is an Economy Smile Class seat. This seat may not recline. Proximity to the lavatories and galley may be bothersome. 59 C None No Power Seat 59 C is an Economy Smile Class seat. This seat may not recline. Proximity to the lavatories and galley may be bothersome. 59 H None No Power Seat 59 H is an Economy Smile Class seat. This seat may not recline. Proximity to the lavatories and galley may be bothersome. 59 J None No Power Seat 59 J is an Economy Smile Class seat. This seat may not recline. Proximity to the lavatories and galley may be bothersome. 59 K None No Power Seat 59 K is an Economy Smile Class seat. This seat may not recline. Proximity to the lavatories and galley may be bothersome. 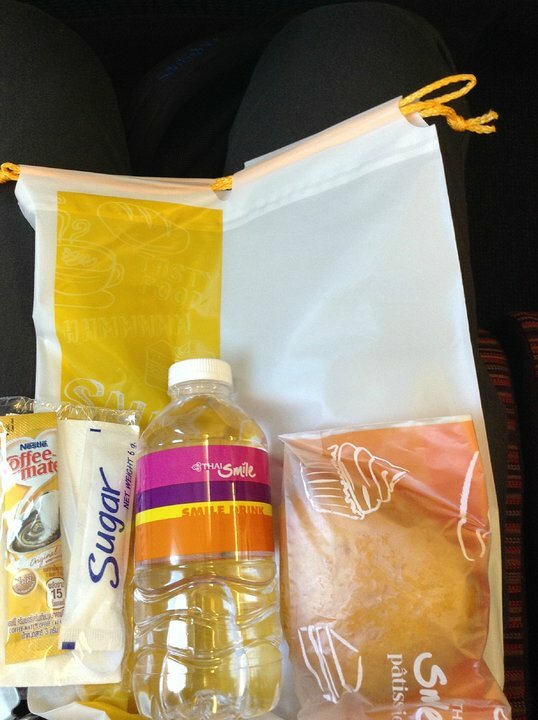 On all flights, Economy passengers are offered a complimentary beverage and snadwich or light snack. 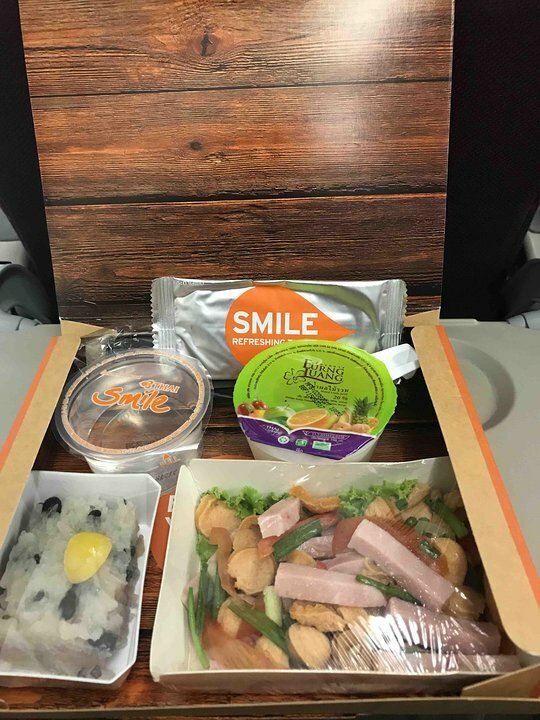 Smile Plus passengers are offered and complimentary hot meal on all flights, and complimentary alcoholic beverages on international flights only. 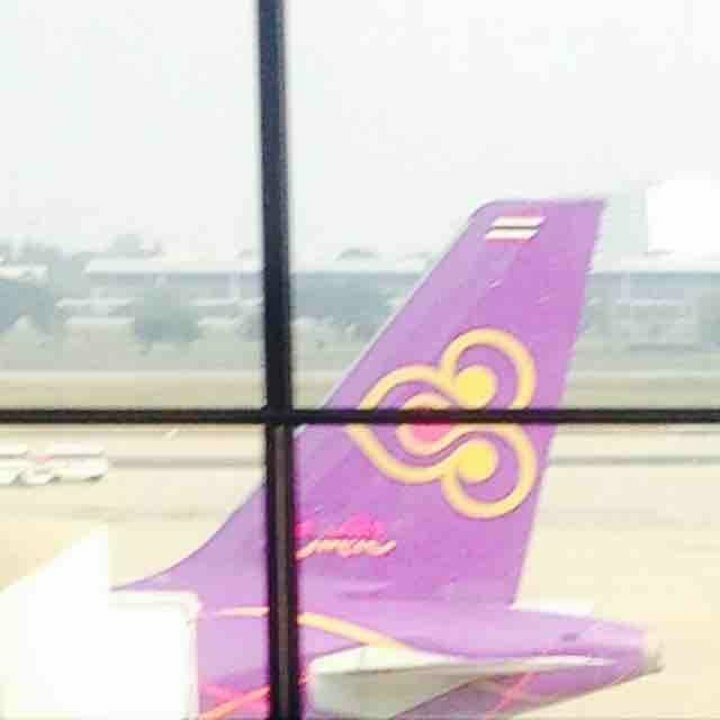 Thai Smile fleet was released in June 2012 flying a number of A320-200 aircraft. The interior and exterior designs of this fleet were developed to reflect the fun and trendy style of Thai Smile. The cabin is configured into two classes: Smile Plus and Smile. Smile Plus is the Business Class in which the middle seats are always empty to allow passengers more space. Smile Plus features 16 seats on internationsl flights and 12 seats on domestic flights, so seat configuration will vary on this A320-200. This seat is one of the extra legroom seats. While there is no separate class/designation for the extra legroom seats, the seats in the forward cabin up until row 43 have wider pitch than those in the rear cabin. 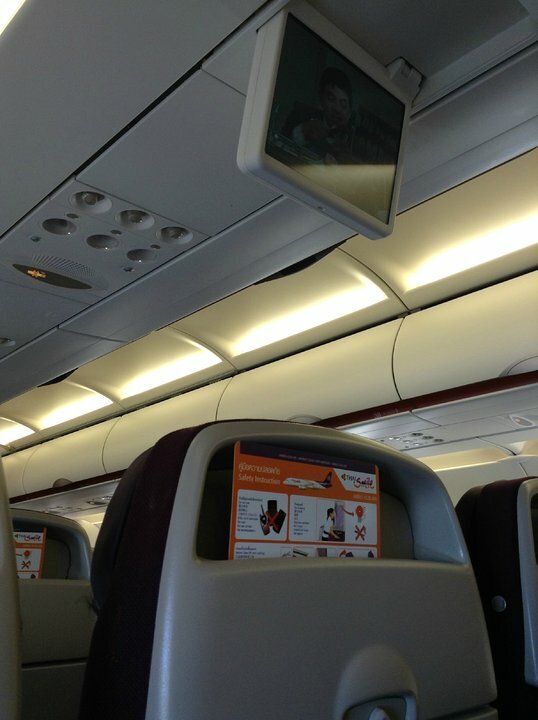 The seats on this plane are like on Thai Smile. They're extremely cramped. It's like going on the basic overland buses where you fgeel like your legs are going to be amputated just under the knee. Nothing to do with their good longhaul service, except for the beautiful colours of their planes. 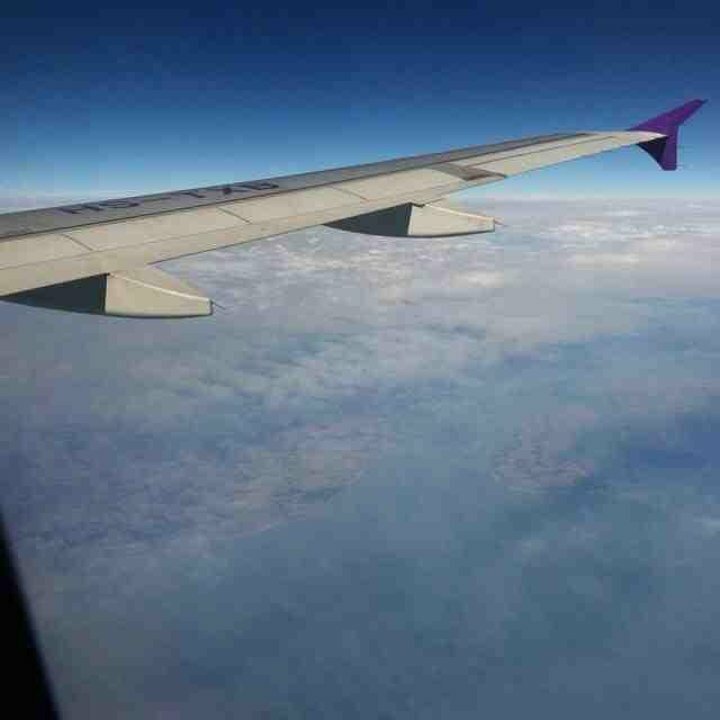 good view with windows, perfect aligned both recline and normal seat position. Private when less passenger on board. THAI flies 1 versions of Airbus A320-200.